This is a demonstration of the Good News Program, brought to life on the Web. Good News is a simulation of a news feed from a variety of news agencies around the world, e.g. Tass, Reuters, BBC etc. In this demonstration, there are two news stories. The first covers an earthquake centred in Armenia whilst the second is about the Braer Oil Tanker disaster near the Shetland Islands. You are provided with a news ticker - a window which delivers news to you from the news agencies over a period of time. Your task is to put all of the reports together and produce a newspaper or newsletter about the disaster, using the information provided. Think about what is important here: are you going to use absolutely everything sent through to you, or are you going to have to sift through the messages and pick out the most important or relevant facts? When you start, by selecting the titles below, the news feeder will open and begin sending you messages. You can print each message by clicking on the printer when the message has paused. If you prefer, you can copy text and paste it into a word processor or desktop publishing program. An additional window opens automatically to display images associated with the news items: click on the heading of each news item to display an image. For more information, click here: Help. Good luck! Do you think you can create a Good News story? 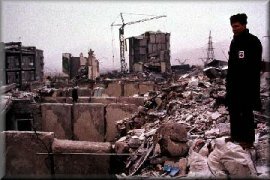 On Wednesday, December 7, 1988, at 11:42 a.m. local time, an earthquake measuring 6.9 on the Richter scale shook northwest Armenia for 40 seconds, leaving over 25,000 people dead, thousands more injured, and some 500,000 homeless. Within seconds, buildings and structures in 58 villages and four cities were reduced to heaps of rubble and ash. International Red Cross rescue squads went in as soon as the news hit the wires, bringing blood, plasma, drugs, medical supplies, blankets, tents, and rescue dogs. The Red Cross provided food supplies, drinking water in packets, clothing, emergency shelter for the homeless, and helped erect emergency hospitals. Despite its moderate size, the deaths and damage that the December 1988 earthquake caused made it the largest earthquake disaster since the 1976 magnitude 7.8 earthquake in Tangshan, China that killed more than 240,000 people. The Town of Spitak (population 25,000) was nearly leveled and more than half of the structures in the City of Leninakan (population 250,000) were damaged or destroyed. Damage also occurred in Stepanavan and Kirovakan and other smaller cities. Direct economic losses were put at $14.2 billion (U.S.) at the United Nations official exchange rate. 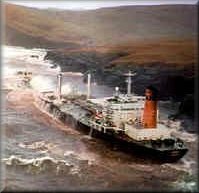 At 05.19hrs on Tuesday the 5th January 1993, Lerwick coastguard was advised that the tanker Braer, en route from Mongstad in Norway to Quebec in Canada, laden with 84,700 tonnes of Norwegian Gulfaks crude oil, had lost engine power but was in no immediate danger. Her estimated position then was 10 miles south of Sumburgh Head and she was drifting in predominantly south westerly winds of force 10-11. The coastguard alerted rescue helicopters from Sumburgh and RAF Lossiemouth, and made enquiries about the availability of local tugs. At the coastguards suggestion the master agreed that non-essential personnel should be removed from the vessel - 14 of the 34 crew were taken off by the coastguard helicopter from Sumburgh at 08:25. At 08:50 it was feared that the ship would founder near Horse Island and the experience of the Aegean Sea which burst into flames shortly after grounding lead the coastguard to persuade the captain to abandon ship. However, because of strong NW local currents the Braer moved against the prevailing wind and missed Horse Island drifting towards Quendale Bay. With the arrival on scene of the anchor handling vessel Star Sirius it was decided to attempt to try and establish a tow. The master and some personnel were taken out by helicopter and were put back on board the vessel. Efforts to attach a heaving line were unsuccessful and at 11:19 the vessel was confirmed as being grounded at Garths Ness, with oil being seen to flow out into the sea from the moment of impact. At this time the rescue team were taken off by the helicopter. If you would like to see your own news stories appearing in Good News on the Web, send them in for publication. Ideally, you should break your story into 20 to 30 short news items and suggest (or even create your own) images to go with each item. We will select the best stories and turn them into a Good News scenario. You can e-mail your stories to Anne Stoker at the Centre in plain text format or as an attachment in your favourite word processor. Good luck.